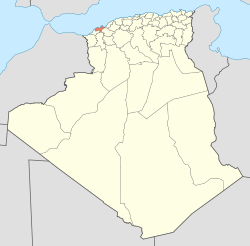 Oran (Arabic: ولاية وهران‎) is a province (wilaya) in Algerie whose seat is the ceety o the same name. It is locatit in the northwastren pairt o the kintra. Its population is 1,584,607 an it covers a total aurie o 2,114 km². The province is bordered tae the east bi the provinces o Mostaganem, tae the sooth east bi Mascara, tae the sooth wast bi Sidi Bel Abbes, an tae the wast bi Aïn Témouchent. The province wis formed frae the umwhile French depairtment o Oran, which wis maintained efter unthirldom an wis transformed intae a wilaya (province) bi the ordnance o 1968. It inheritit its current structur efter the re-organization o 1974, when it lost its wastren an soothren pairts in favor o the creation o Sidi Bel Abbès Province. As o 1984, the province is dividit intae 9 destricts (daïras), which are further dividit intae 26 communes or municipalities. Wikimedia Commons haes media relatit tae Oran Province.